KBW Packaging offers a range of Accumulation Table, Unscrambling and Reservoir Rotary Table Machines. These ancillary pieces of equipment provide a smooth flow of containers, throughout the packaging line, for more efficient output. Hence, they enable infeed and outfeed management for both product and resources, to and from the packaging line. 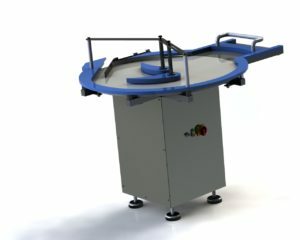 The Rotary Table range is most suitable for round containers. The operator loads the containers manually to the loading tray of the rotary Unscrambling Table. The loading tray position is configurable depending on line layout arrangement. The mounting arrangement of the Rotary Table, relevant to the front or rear of the main conveyor section is also configurable. 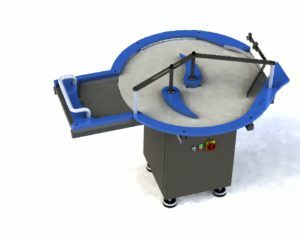 The operator, using the bottle pusher, manually moves a group of pre-positioned containers forward onto the rotating table. 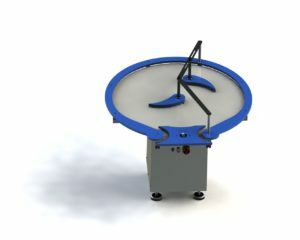 Then, the adjustable deflectors guide the containers, as they travel around the rotating table. The deflectors and can be positioned to suit various sizes of containers, as they are adjustable. The deflectors guide the containers individually, radially outwards, to the periphery of the turntable. A single queue of containers is generated, and they exit the rotary table, travelling onto the infeed conveyor of the packaging line. The Accumulation Table is for use at the outfeed end of the packaging line. The Accumulation Table is used to collate or accumulate, the completed containers, in readiness for any further customer packaging processes. Finally, the Reservoir Table provides a ‘mid-stream’ buffer along the packaging line, when there is a requirement for this. 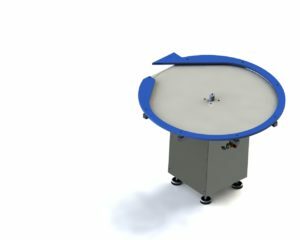 The infeed transfer point from conveyor to table, allows the containers to feed onto the Table. The exit transfer position from Table to conveyor, allows the containers to return to the conveyor, when the need for buffering has been alleviated. Consequently, the Rotary Table range enables a more efficient packaging line, as it provides smooth flow of container product throughout. The Table diameter is typically based on 900mm although 1200 tables are an option. Large capacity table for use on the infeed. Inverter controlled variable speed drive. Tool-less design for fast product changeovers. Large capacity table for use centrally as a buffer. Also Inverter controlled variable speed drive. Finally hygienic design using FDA approved materials. Large capacity table for collecting on the outfeed. Furthermore Inverter controlled variable speed drive.